Four successful women in their sixties — Diane (Diane Keaton), Vivian (Jane Fonda), Sharon (Candice Bergen) and Carol (Mary Steenburgen) — each have something in her life that she needs to set right. Vivian is a wealthy hotel magnate who has been ignoring love for most of her life, settling instead for flings. Sharon (Candice Bergen), a Supreme Court justice, still hasn’t gotten over her divorce and hates the fact that her ex-husband is dating a woman young enough to be his daughter. Carol (Mary Steenburgen) is married, but her husband shows no interest in her. 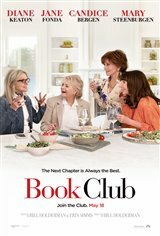 Diane (Diane Keaton) is a widow whose grown daughters treat her like a child. Having read the book Wild the month before, but feeling unable to relate to it, Vivian decides to introduce the women to Christian Grey – the handsome title character of the bestselling novel Fifty Shades of Grey. The other women protest her choice at first, but soon each one is captivated by the story. From discovering new romance to rekindling old flames, they inspire each other to make their next chapter the best chapter.